Are ya ready? 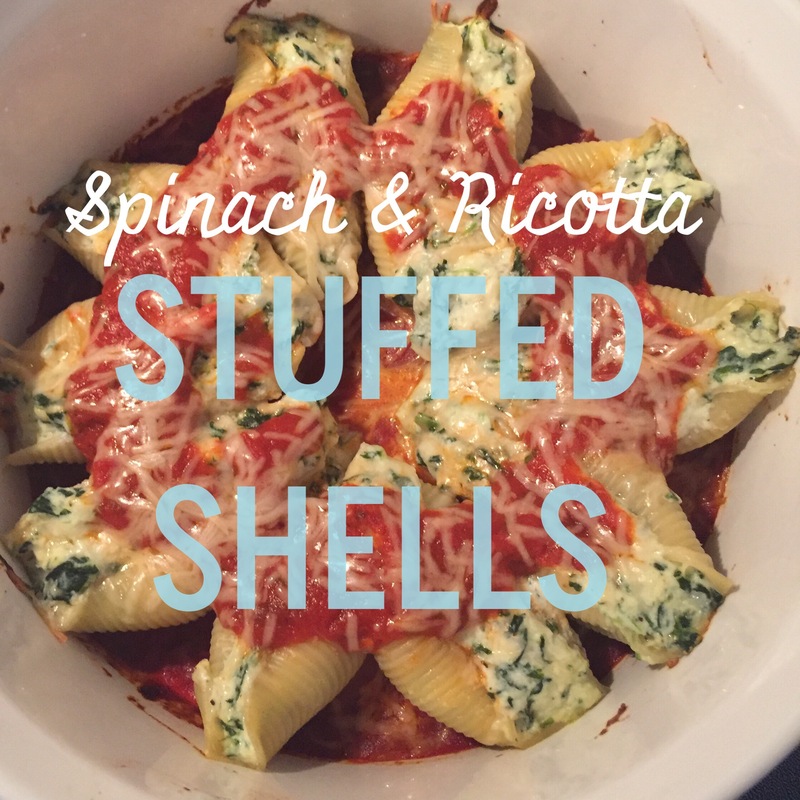 This recipe is a family favorite (even with spinach!). It happens to be vegetarian but I often serve them along side meatballs (nothing fancy- frozen meatballs in a pot of jarred sauce). It makes about three dozen shells (10-12 servings) and I often freeze half or pass it on to friends since it is easily assembles and heated. Bring a large pot of water to a boil. While I wait for the water to boil I set up a sort of assembly line. I hadn’t thought to photograph that.. oops, blogging fail. Basically I have the water boiling on the stove. Directly next to the stove I lay out parchment paper to lay the cooked shells on. Next to that I have my bowl (we’ll fill that in a minute) of ricotta mixture and then another parchment for the filled shells. Then I have several freezer bags (if I intend to freeze a batch) or my greased pans with marinara and Parmesan ready nearby. Cook shells in batches of 5-8 (depending on size of your pot) according to the timing on the box. 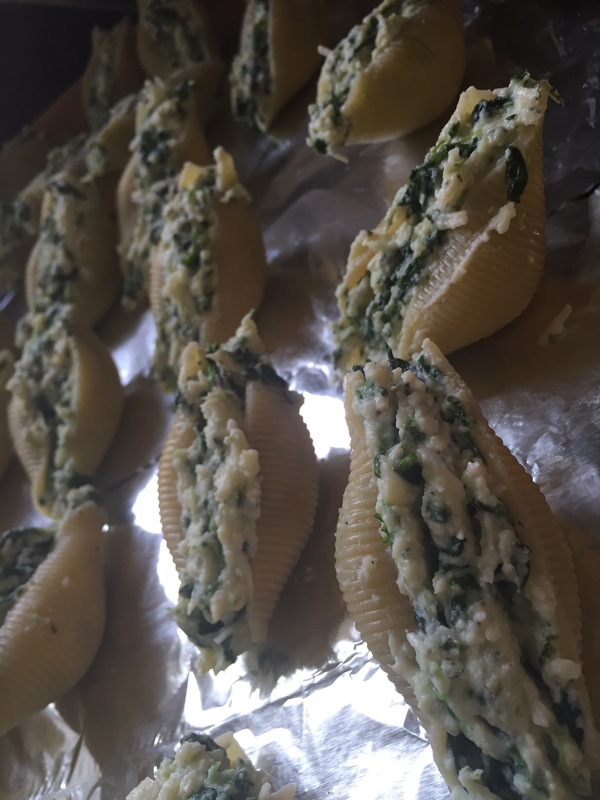 Slightly under-cooked shells are okay and actually easier to fill because they keep their shape and don’t tear as easily. An overcooked shell will work fine but will require more care when removing from the water and filling. Also, I recommend a splash of olive oil in the water to keep the shells from sticking together. Defrost the frozen spinach and drain well. For good measure I also use a large chef’s knife to chop the spinach again. I know, I know… The package says its already chopped. But I’ve found that chopping more makes the spinach less stringy and and more “bite size”. This is particularly helpful for the kids, as we want them to virtually forget about the spinach anyway, right?! For the fill mixture: Beat 3 eggs. Add ricotta and mozzarella cheeses and season with parsley, oregano, salt and pepper. 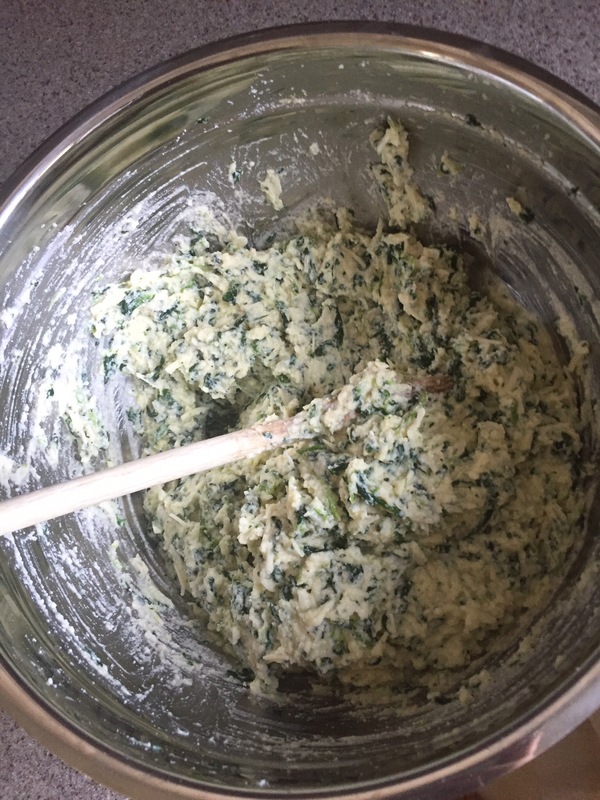 Stir in spinach. 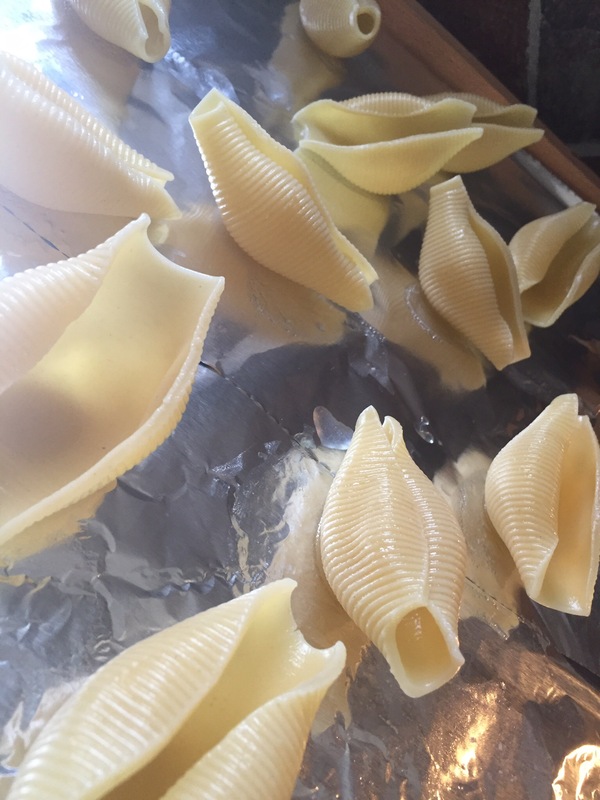 As the batches of shells are ready, pull them from the water with a slotted spoon. Lay them on parchment paper and allow to cool. Carefully spoon filling into each shell so as not to tear the shells. Set aside to cool on parchment. 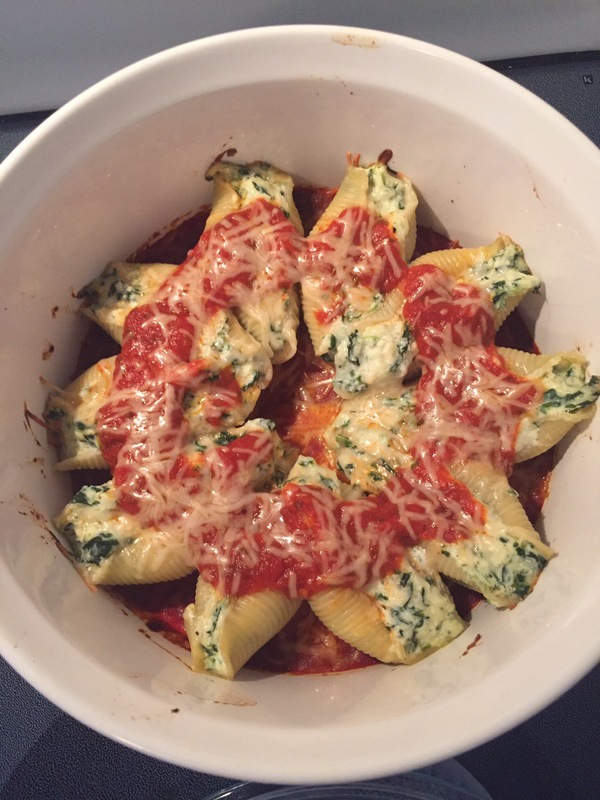 pour thin layer of sauce in pan and arrange shells upright and tightly in baking dish. 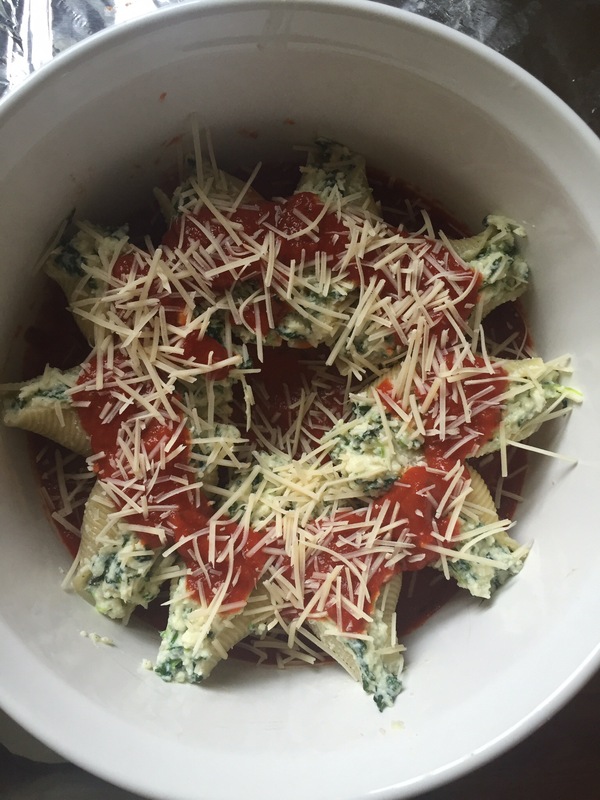 Spoon Marinara sauce over each shell and sprinkle with Parmesan cheese. Bake at 350F for 35 minutes or until sauce is bubbly. If you’re freezing some or all of your shells be sure to let them cool completely ad then place in freezer bags with as little air as possible and being careful to keep them facing upright until frozen. Once you’re ready to use the frozen shells, remove from freezer and assemble shells in baking dish as instructed above. Allow to “thaw” on refrigerator overnight to 24 hours before baking. Enjoy, as always, with a glass champagne! 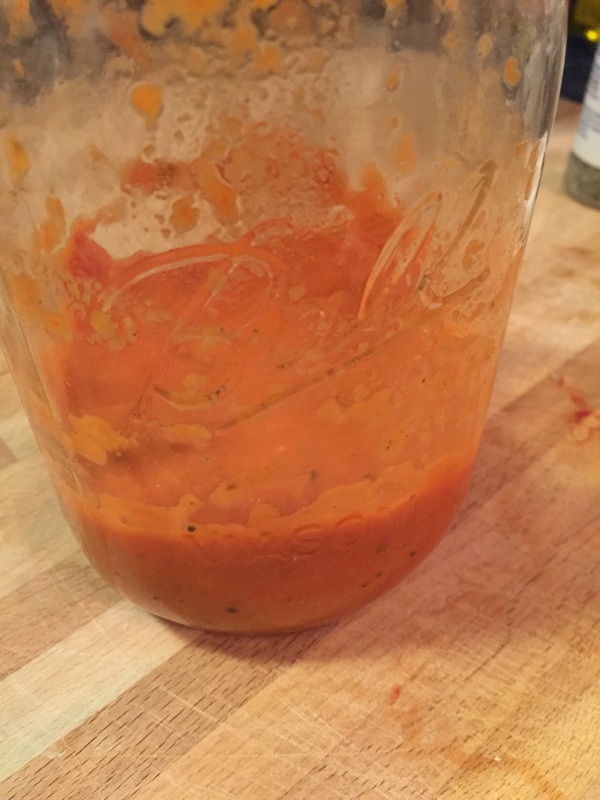 I used to be so intimidated to make my own pasta sauces. Doesn’t that sound like something a full blooded Italian (which I’m not) can whip up with a glass of wine in one hand and without breaking a sweat? Intimidating. I’ve been playing around with it though… learned a few basic recipes, married a few new techniques. And I came up with a pretty easy (and vegetarian!) recipe that tastes like you spent all day in the kitchen. Ready for it? 1 T dried Basil or 3 T fresh Basil… I just cut about a dozen fresh leaves with scissors. Heat Olive oil in large skillet over medium heat. Add onion, garlic, paprika and crushed red pepper. Heat on mediu-high for 2 minutes until onions become golden. *Note: Start small with the paprika and red pepper… just sprinkle enough to give the onion a little dusting and red color. The flavor will intensify later and you can always add more later. Add tomatoes, water, basil, oregano. Bring to a boil and reduce to simmer for 10-15 minutes. While it’s simmering you can taste to add more paprika, red crushed pepper or salt and paper. This is also when I boil water for the pasta. Add heavy cream and immediately remove from heat. To make it vegan you could use almond milk, although I haven’t tried it myself yet. Pour contents into blender/food processor. Pulse until smooth. *Note:It will be hot so make sure its glass or heat resistant plastic. I use large Ball jar with my blender. 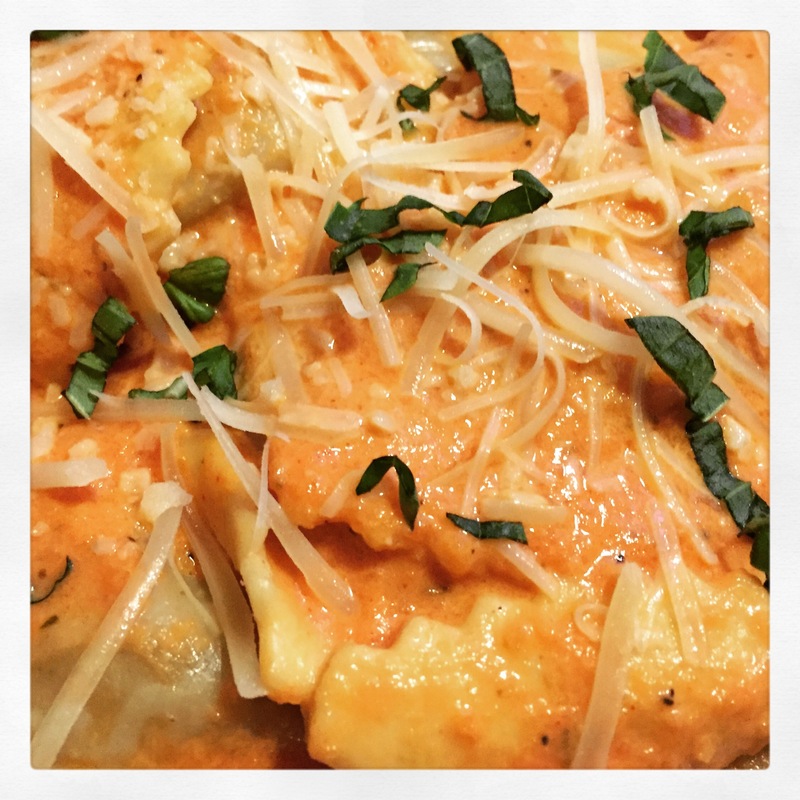 I served my sauce over Roasted Butternut Squash Agnolotti (Buitoni) with fresh basil and a sprinkle of Parmesan cheese. Hubby says it would be delish with shrimp or chicken over Penne or Fettuccine too! You can make this as mild or spicy as you like! I jarred the rest of the sauce (take note of the expiration date on your cream) and ate leftovers for lunch yesterday. So yummy if I may say so myself! I should start this post out by stating a little fact about myself: I don’t eat meat (fish, chicken, beef, veal, etc- but I do eat eggs and dairy). I haven’t for about 16 years. I do, however cook meat and such for Hubby. But when I make recipes up, its literally on a whim. I go “hmmm… I wonder if this and this would be good on chicken?” and then I run it by Hubby. I’m never surprised to have some total misses. This is one of Hubby’s favorite home-runs though. 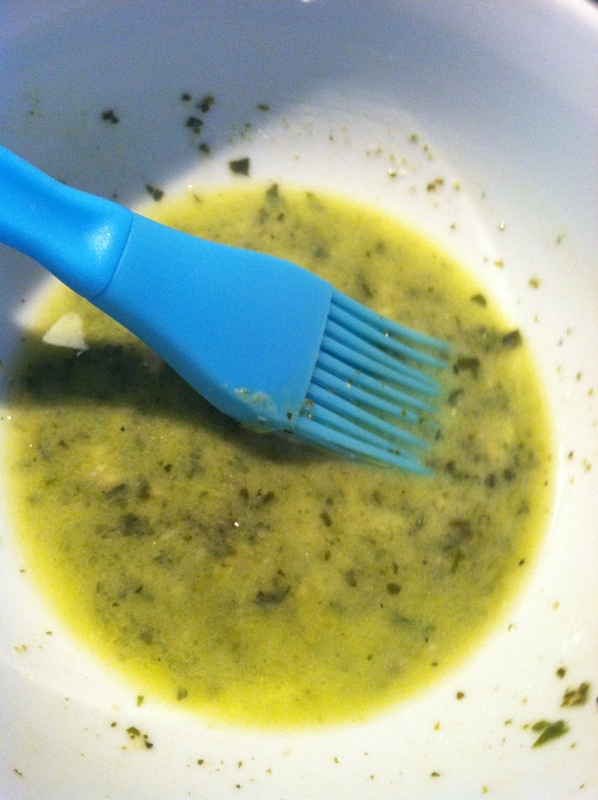 I knew he loved pesto and I whipped this up. Here’s what you need. Preheat your oven to 375, grease a glass baking dish. 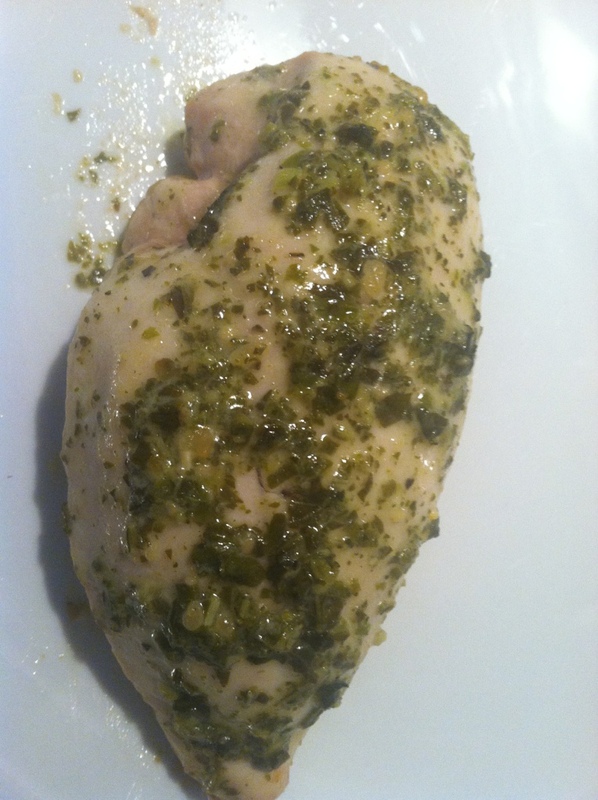 I make single servings, but basically you’ll need boneless skinless chicken breasts, lemon juice, pesto and olive oil. 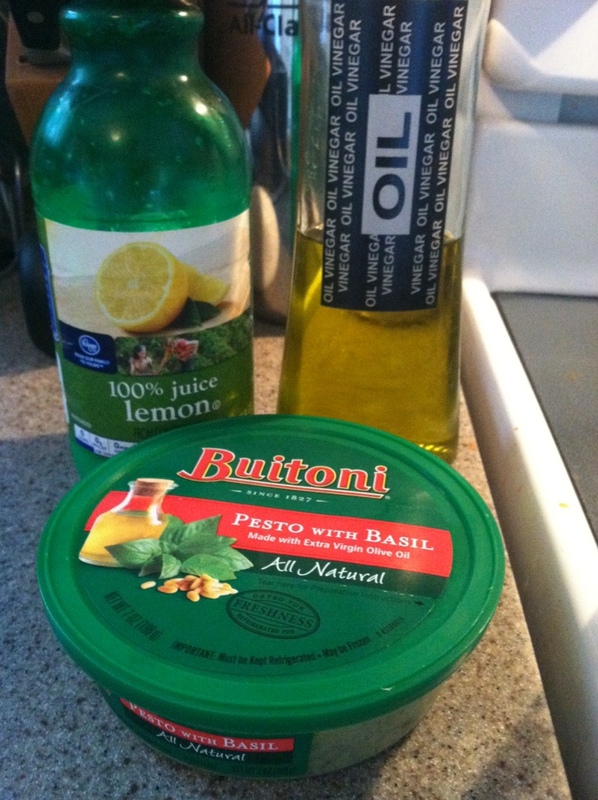 For each chicken breast measure 1 Tbsp of each: lemon juice, pesto (I keep Buitoni on hand but homemade, prepackaged mix or whatever will work), and olive oil. Mix in a small bowl. 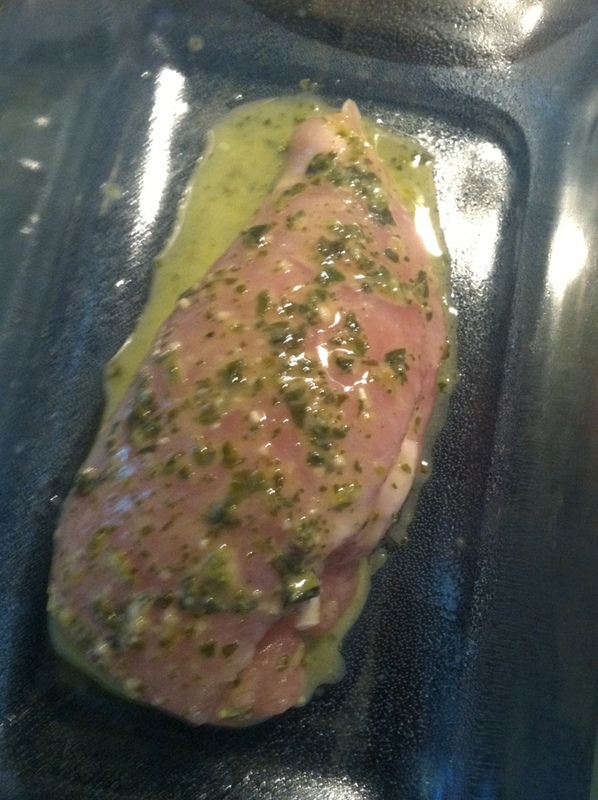 Brush the mixture onto each chicken breast. Bake 45 minutes, I like to take it out with about 20 minutes remaining and brush the remainder on to keep it moist and flavorful. Ta-Da! You can serve this with a simple salad, garlic potatoes or slice it up and toss it with pasta, veggies, parm and more pesto. I often serve it with caesar salad and tortellini since I can eat those too. Whatever floats your boat. Enjoy!